Pop ups seem to be becoming all the rage. A chance to do something a bit different. In a couple of weeks time, Dishoom (the popular "Bombay Cafe") opens it's doors to it's first venture outside Covent Garden. Taking over an old artists studio, it is invading the Southbank with a Chowpatty Beach popup, named after the eponymous beach in Bombay, and I was lucky enough to be asked along for a sneak preview. The space itself was still being built, but embracing the spirit of "jugaad" or "make do", most of the materials have been reclaimed or recycled. Outside is a canopy made from carrier bags (which have been hidden behind perspex in line with health and safety regulations) and benches made from old railway sleepers. Inside you have the main serving area made from sheets of colourful plastic (made from old bottles), walls of woven materials and newspaper, and even panels comprising of a multitude of recycled objects. 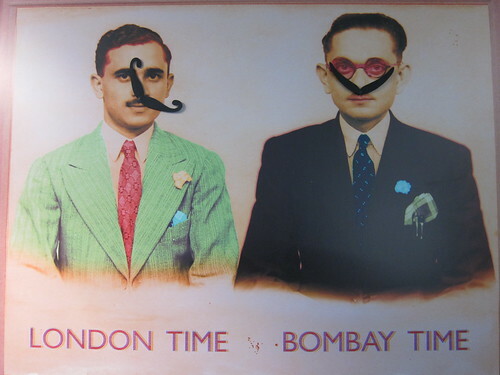 An amusing Bombay/London wall clock completes the look with moustaches as the hour and minute hands. "Dishoom on acid" according to the designers. 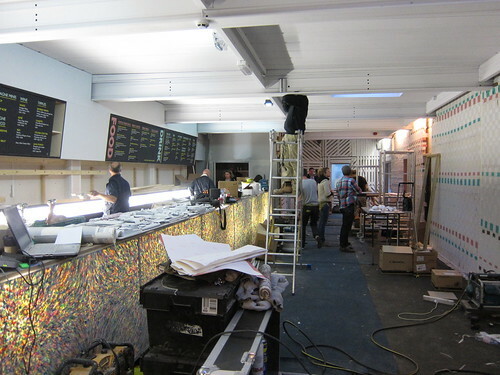 With regards to the food options, the guys behind Dishoom said it was a chance to do something a bit different". As well as a few "Ruby Murray" (curry) options, the curtailed menu that they will be serving focuses on some rolls and beach snacks synonymous with the real Chowpatty beach back in Bombay. I was given a taste of some items which aren't currently on the Dishoom menu. First we were brought some bhel, which was a small cup of delicious goodness. 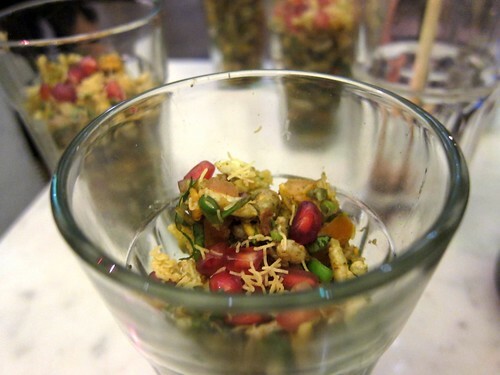 Made up of a mixture of mixed herbs, vermicelli, puffed rice, nuts, pomegranate and subtle spicing, the combination of flavours just danced around in my mouth. Next up were a few other beach snacks. 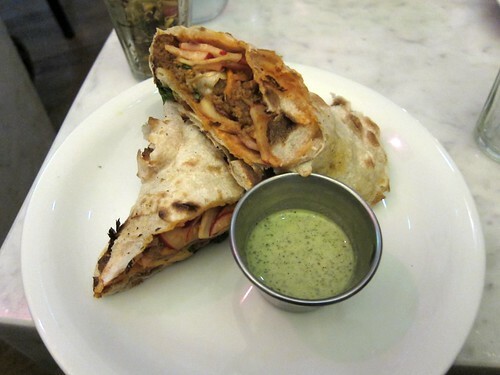 A "Frankie" was a naan roll stuffed with cabbage, radishes and lamb in a spiced tomato sauce. A great dish which will help me ease my daily lunch quandries (once it is unleashed on Covent Garden). 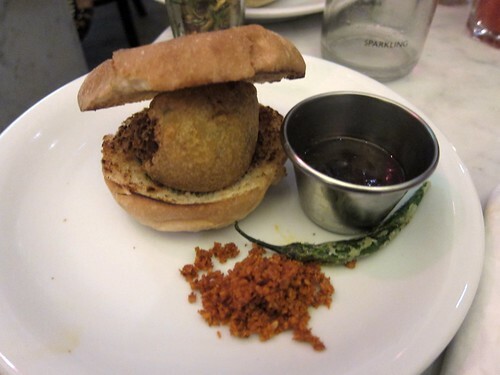 Last up was "the ultimate chip butty" or a vada pau, basically a spiced potato cake in a bun. Sounds heavy right? I thought so too, but was surprised at how light it was, and once again the spicing was spot on. Drizzled with the sweet and slightly tangy chutney, I devoured it. If you fancy a drink with your snacks, you will be spoilt with a wide variety of alcoholic (and non-alcoholic) beverages. Ranging from mini bottles of champagne supplied with a straw and cocktails, you won't be left short of choice. For a slightly left field option try a kala khatta flavoured gola, a hand molded crushed ice lolly drizzled in the kala khatta syrup and dipped in a healthy serving of gin. 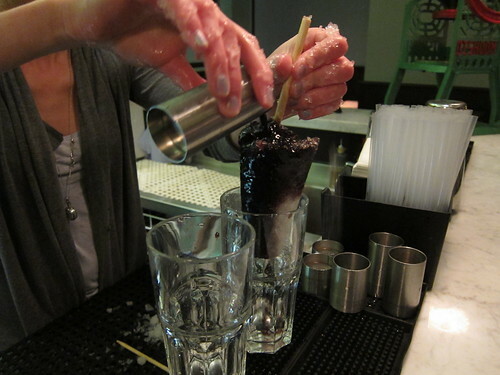 The thick tangy blueberry like syrup had slight herbal notes and was a great combination with gin. 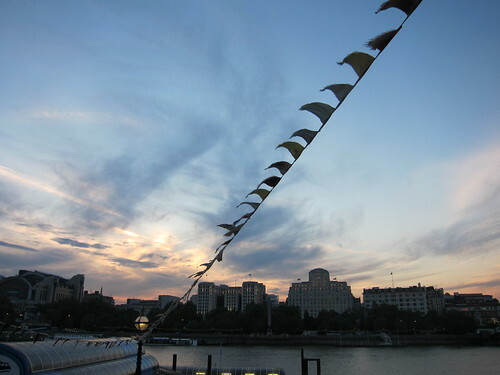 The Southbank has long been one of my favourite parts of London. The views along this stretch of the river remind me about everything that is great about London, and can be a wonderful place to lose yourself or spend time with friends. With the festival of Britain lining up a series of events, the whole area is not to be missed. 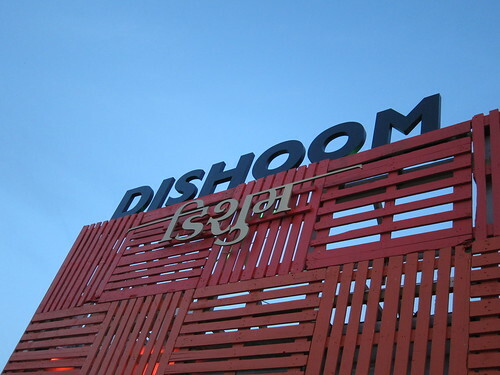 Dishoom Chowpatty Beach Bar promises to be an excellent addition to Southbank, albeit for a mere 5 months. It's going to be party time on the Southbank, and Dishoom looks like it may well be the jewel in the crown. I should not have read this while hungry - can't wait for it to open. I love Dishoom. This sounds great - proper Indian street food is slowly coming on to the scene here in London - hurrah. Indian potato cakes are some of the best I've tasted and that Bhel sounds like the real deal. Happy days, the perfect food to snack on while watching a Southbank sunset is here.